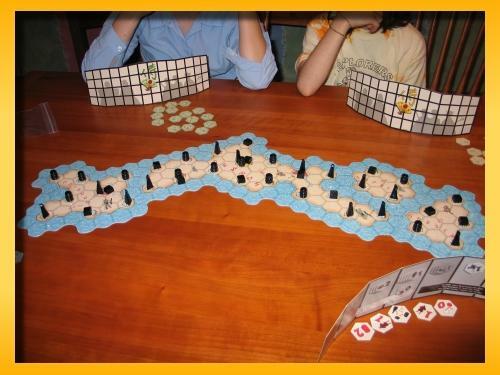 The initial board layout of Samurai. It had been awhile since we’d played but we all were back up to speed on the rules pretty quickly in this great offering from Reiner Knizia. When I bought this game it was one of the last ones around and it was going out of print. However, I think more have been printed and it’s available from most online ‘designer game’ stores. 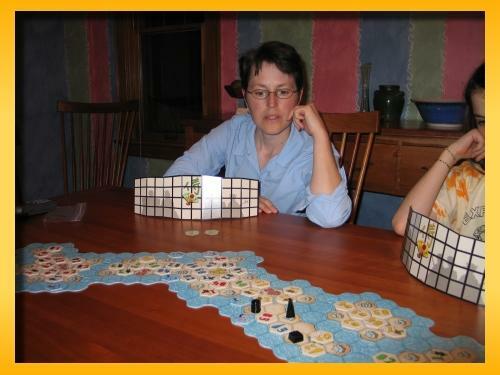 Lisa is contemplating her final move which ended the game clinching her victory and taking the final three pieces. I’ve never played a game that had one each of high hat, rice paddy, and buddha and the final player was able to play several tiles to ensure dominance over all three final pieces. This month’s game was Rich’s unopened copy of San Juan by Andreas Seyfarth. It’s been a little while since we’ve played but this lighter “card game” form of Puerto Rico is pretty darned good. I have to agree with Ken though that I think the game would be better with 4 instead of 5. With 4 players, you would always have 1 unchosen role at the end of each round leaving you more unsure of how the round will play out. When you’re sure somebody has to Build, Trade, or Produce every round, then it leaves a little bit to be desired. However, that being said, I do like to play this game. I felt a little bad at the end because the final score left me the winner but I have no idea how that happened. There was some question about how I counted my cards etc. and it felt like a ‘dirty’ victory. I even zoomed in on the final shot of the table and counted my Victory Points again and I think I was right on. I feared I might have counted my Chapel cards as violet cards but I hadn’t. The killer card, I believe was the Hero card that I purchased late in the game for 5 VPs that is worth 5VPs in the end.Enough gibberish…here are the pictures and ridicule. Keith showed off his new Canon G7 to one up my Canon G5 and I’ve included a few of his shots as well.